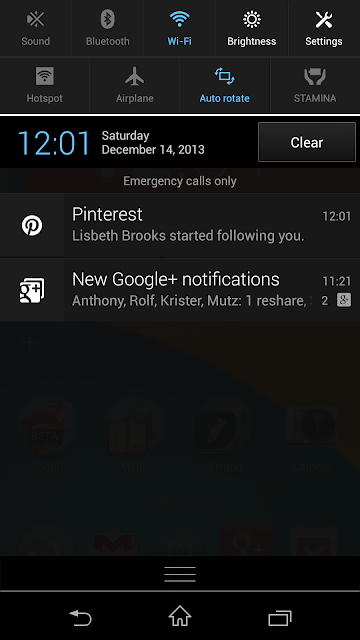 A lot of reviewers around the web is complaining about the rather “busy” notifications menu on the LG G2. But I am sure that they don’t know that it can be customized. Yes you still can’t get rid of the annoying volume slider but that is the only thing I can’t remove that I don’t want to have there. As you can see it is plenty of room for real notifications. The only thing left there that I don’t want to have there is the volume slider. And still, I think it looks quite clean and fresh even with that slider still there. The Brightness slider I want to have there, it’s very useful to be able to change brightness fast. And all the customizations I have done is default features from LG, so no need for hacks or rooting to get rid of the things there. Just go into the settings and remove what you don’t want to have. There is an edit button if you scroll to the right end of the two menu bars that are there by default. I removed one of the menu bars because I didn’t need it. So it’s a myth that the LG G2 has an ugly and too cluttered Notifications Menu, yes it really is by default, but you can easy fix that by customize it. To me, it’s very useful now after I have customized it how I want it. I like it a lot.